SIGIR audit reports identified internal control weaknesses such as inadequate reviews of contractors’ invoices, insufficient numbers of, or inadequately trained oversight staff, poor inventory controls, high staff turnover, poor recordkeeping, insufficient price competition by subcontractors, and weak oversight of cash disbursements. 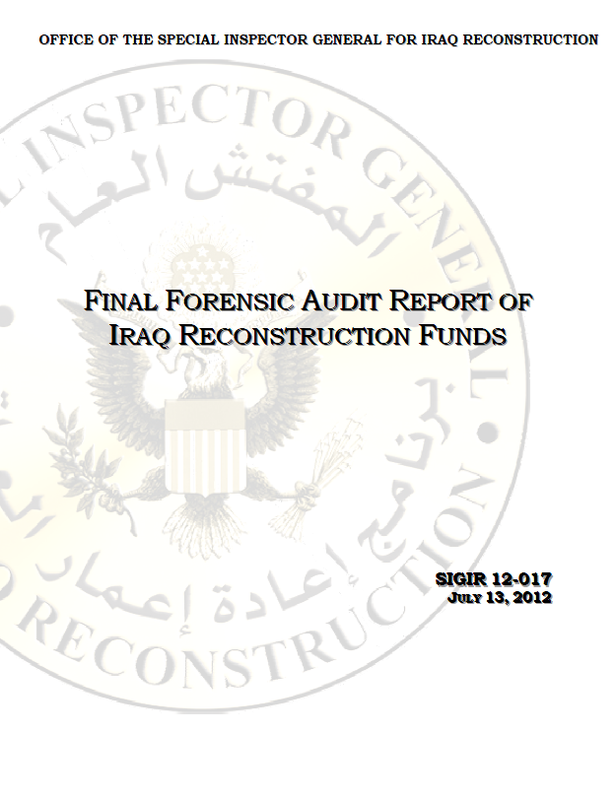 For example, SIGIR’s audit of a DoS contract for Iraqi police training program support found that more than $2.5 billion in U.S. funds was vulnerable to fraud and waste as a result of poor DoS oversight. Another SIGIR audit of a DoD contract for warehousing and distribution services found that the contractor’s business systems had not been adequately reviewed. Business system reviews are the government’s primary control to ensure that prices paid are reasonable and allowable. Weaknesses in internal controls open the door to opportunities for fraud and other illegal activities. As of June 30, 2012, SIGIR investigators, working with other agencies’ investigators, have developed information used to indict 87 individuals and convict 71 individuals for fraudulent activities including bribery, kick-backs, theft of government funds and property, inflated invoices, delivery of insufficient or inferior goods, and bid rigging. For example, a U.S. Army Captain was convicted of stealing $690,000 intended for security contracts and relief and reconstruction programs. A regional vice president of a logistics company was convicted of a scheme to inflate invoices for military shipments to Baghdad through the firm’s contract. The estimated loss to the U.S. government was approximately $1 million. SIGIR found few problems in the agencies’ invoice payment processes. SIGIR tested 180,000 DoD, DoS and USAID payment transactions totaling about $40 billion. SIGIR looked for problem transactions such as duplicate payments, payments to fictitious vendors, or inappropriate separation of duties of individuals in the payment process. Overall, SIGIR’s tests found that once invoices were approved for payment, the payments were essentially processed correctly and to valid vendors. However, because of the internal control weaknesses discussed above, government agencies cannot be certain that the payments were for goods and services that (1) were actually received, (2) met contractual specifications, (3) were in accordance with the contract prices, or (4) were competitively priced. However, upon further review of key documentation such as state business licenses, web sites, invoices, receiving documents, and payment records, we confirmed the legitimacy of these contractors. Mr. Samir Itani owned and operated American Grocers Inc, which furnished food to Public Warehousing Company under a DoD subcontract to supply food to U.S. troops in Iraq. Mr. Itani conspired with Public Warehouse Company to overcharge the government for bogus trucking costs and for food shipments that never occurred. Mr. Itani was sentenced to two years imprisonment followed by three years supervised release and was required to pay a $100,000 fine. Mr. Jeff Mazon, a materials and property procurement manager for Kellogg Brown & Root Services, Inc., the prime contractor for the government under the Logistics Capabilities contract, inflated the bid from one subcontractor and then inflated the bid from a second subcontractor by a greater amount to make the first subcontractor appear to be the lower bidder. Kellogg Brown & Root Services subsequently awarded the contract to the lower cost first subcontractor. The scheme resulted in Kellogg Brown & Root Services paying an excess of $5.5 million to the subcontractor. Mr. Mazon was sentenced to 1 year probation and 6 months of home confinement and was required to pay a $5,000 fine. U.S. Army National Guard Lieutenant Colonel Levonda Selph served as a member of a team to select the winning contractors in competitive procurements. In her official capacity, Lieutenant Colonel Selph solicited bribes, including cash and vacations in Thailand, in exchange for rigging the bidding process to ensure a Kuwaiti contractor received a renewal on his contract for the construction, maintenance, and operation of warehouses in Iraq. Lieutenant Colonel Selph was sentenced to 12 months in prison followed by 3 years of supervised release and was required to pay a $5,000 fine and $9,000 in restitution. Mr. Anthony Martin, a subcontracts administrator and subsequently a subcontracts manager with Kellogg Brown & Root, received kickbacks from the managing partner of a Kuwaiti company to award a subcontract related to U.S. military supply lines between Kuwait and Iraq. In conjunction with his duties to solicit bids from prospective subcontractors and negotiate and award Kellogg Brown & Root subcontracts, Mr. Martin selected the Kuwaiti company’s bid and then added $200,000 to the subcontract amount which he then received as his kickback. Mr. Martin was sentenced to one year and one day in prison followed by two years of supervised release and was required to pay $200,504 in restitution. Ms. Bonnie Murphy, a DoD civilian in Iraq, was tasked along with others to manage and dispose of surplus DoD property. Ms. Murphy was authorized to recommend qualified contractors to carry out those tasks. She accepted jewelry, worth approximately $9,000, from the owners and employees of an Iraqi company in exchange for justifying a non-competitive contract to the Iraqi company. Ms. Murphy was sentenced to one year of supervised release and was required to pay a $1,500 fine. U.S. Army Captain Faustino Gonzales received approximately $25,000 in kickbacks in exchange for awarding reconstruction contracts at inflated prices in Iraq. Captain Gonzales deposited bribe money in bank accounts in Killeen and San Antonio, Texas and also used some of the money to purchase a vehicle. Captain Gonzales was sentenced to 15 months in prison followed by 1 year supervised release and was required to pay a $10,000 fine and $25,100 in restitution and a special assessment. U.S. Army Major Roderick Sanchez was deployed overseas in Afghanistan, Iraq, and Kuwait as a contracting officer. Major Sanchez admitted to accepting bribes from foreign companies seeking to secure Army contracts. In return, Major Sanchez used his official position to steer Army contracts to these companies. During the course of this criminal scheme, Major Sanchez accepted Rolex watches, cash payments, and other items of value totaling more than $200,000. Major Sanchez was sentenced to five years in prison followed by three years of supervised release and a fine of $15,000. Retired Navy Lieutenant Commander Frankie Hand, and co-defendant Michelle Adams, a U.S. contractor, met in May 2007 at Camp Taji, Iraq. Lieutenant Commander Hand agreed to assist Ms. Adams and her business partner, Peter Dunn, in obtaining U.S. government contracts in exchange for Lieutenant Commander Hand becoming a “silent partner” in their companies. Thereafter, Hand, Adams, and Dunn agreed to pay Mark Carnes, a U.S. Air Force Master Sergeant at Camp Taji, for his “assistance” in getting contracts awarded to their companies. In August and September 2007, Sergeant Carnes helped to steer two government contracts for work on Camp Taji to businesses run by Adams and Dunn, and their silent partner, Hand. After the United States paid $757,525 for the work on these two contracts, Ms. Adams, Mr. Dunn, and Lieutenant Commander Hand jointly paid Sergeant Carnes approximately $50,000 in bribes. Lieutenant Commander Hand received three years in prison and forfeiture of $757,525. Ms. Adams received 15 months in prison followed by supervised release. Mr. Dunn received 14 months in prison followed by 2 years supervised release. Sergeant Carnes received 20 months in prison followed by 3 years supervised release and forfeiture of $57,030.